I’m 24 now if you feel like doing the math. Sad right?! All I can do now is thank the foodie gods for finally letting me hop on to the avocado train, because WOW they are so delicious and versatile! This complete spur of the moment cooking experiment all started with a leftover 1/2 avocado from breakfast. It had *ever* so slightly started to brown in my fridge, so naturally, I *not* ever so slightly began to panic. As most of the world already knows, avos aren’t cheap, and unfortunately for me and my friends on Weight Watchers, they tend to be pretty high in SmartPoints too (11 SP to be exact, unless you have a food scale!!*). That doesn’t mean we can’t have them, it just means we can’t go crazy over points with them! Or perhaps I should say “shouldn’t,” because you know I’ve used my weeklies for them on more than one occasion. *SP for avocados are often less after weighted on a food scale. This is because you’re getting a more accurate item weight. See this Reddit discussion for more info! When in doubt, weigh it! (I did not have a food scale at the time of this post). Today I decided to practice a little self-control and cut the avocado into halves, using 1/2 for breakfast and the other for dinner. Ta-da! That is when this Avocado Pesto Sauce was born. As fate would have it, I happened to have some leftover zoodles in the fridge (skinny pasta could work as well), asking to be used with this sauce. All I can say is what a filling and refreshing 5 SmartPoint dinner 🙂 Keep reading to see how I threw this meal together. I did not measure out my zoodles since they are 0 SmartPoints. 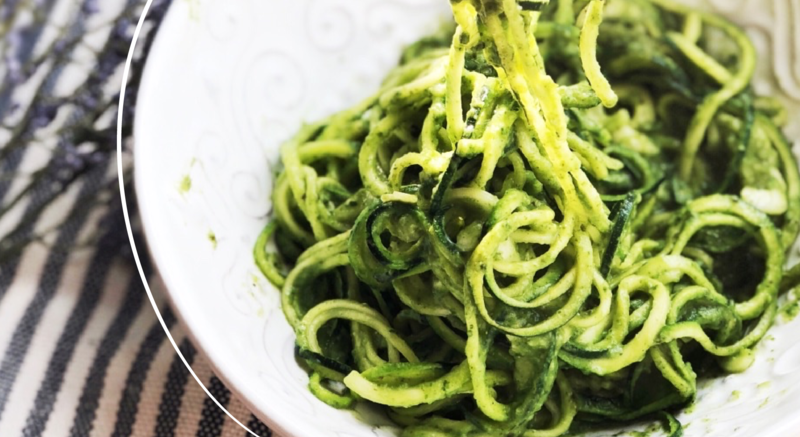 If you like more sauce, use fewer zoodles, and if you like less sauce, use more zoodles. Also, I recommend using the salt & pepper as desired– I used a pretty generous amount but if that’s not for you then go lighter. In a small bullet blender, food processor, or Vitamix, add the avocado, basil, spinach, garlic, lemon juice, water & seasoning. Blend until almost smooth, there should still be some texture. In a pan, begin heating up the zoodles on medium heat. Use cooking spray and a small amount of water to replace oil. Add the blended sauce to the cooked zoodles in the pan, mix together and stir until all zoodles are coated and the sauce is warm. Serve & enjoy! Add a little cheese to you Weight Watchers Zoodles for some extra flavor. I used pecorino romano (1 SP per tbsp).